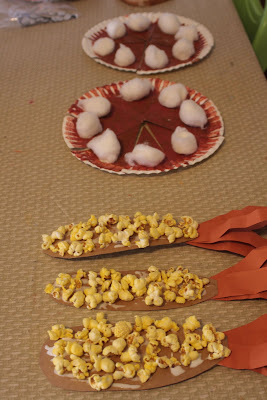 Here are a few Thanksgiving crafts that we have done in years past. These are all pretty simple and can be done with things you probably already have. Here's our family of turkeys!! cut it out, add the pipe cleaners for legs and the googly eye and you're all set. Some corn on the cob!! 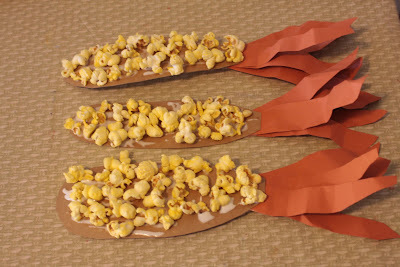 pop the popcorn and glue in onto the shape. the "husks" on the back of the corn. Just paint the paper plate brown and before it dries sprinkle the paint with cinnamon. 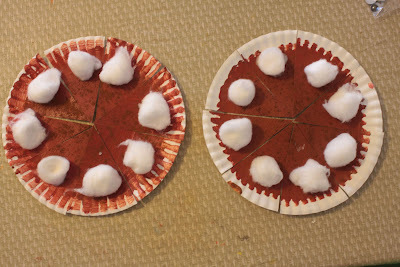 then glue the cotton balls onto the edges of the pie pieces. See, I told you they were pretty easy! (even though it's still two weeks away). That is awesome. 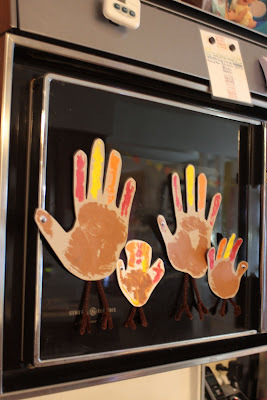 Crafts really is the best way to keep kids busy during thanksgiving day and or weekend. I'm not a football person so I hate sitting through the YEas and Booos of the football craze.